The message is inescapable: the Everglades ecosystem is unique, necessary for our health and should be preserved. The intent is to bring its beauty and importance to people all over the world through the lives of these Living Legends and the Power of their Leadership. 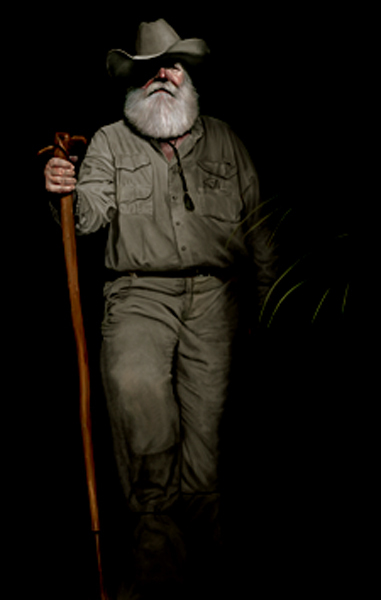 Central to the Guardians of the Everglades® exhibition are Nicholas Petrucci’s eleven 6 x 4 foot oil portraits of people dedicated to protecting the Everglades. Clyde’s enormous, highly detailed black and white photography brings the beauty and complexity of these sub-tropical wetlands to the attention of the public. 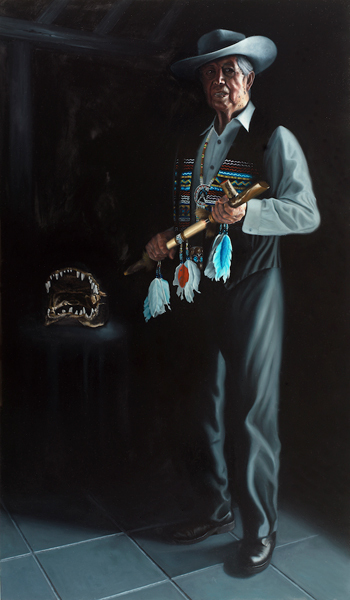 Clyde is emerging from the darkness representing both the often reviled swamp and from the emotional darkness of his son’s death from a drunk driver. It was in the Everglades that he found his solace. Franklin Adams by all accounts is a true Gladesman. He tells wonderful stories about south Florida in the 1940s and ‘50s. He spins magical tales, guiding us through the swamplands, some long gone, others still thriving, thanks in part to Frank’s efforts. In his words, “There is a sense of freedom. You have to experience it. Being part of nature is a rare thing.” Frank still goes in the Everglades alone to experience the freedom, and I chose to picture him alone with his rifle, quietly protecting the wilderness he loves. He asked his loved ones not to worry if one day he did not return home after spending time in the Everglades. It would be ok because that is where he would want his story to end. Chairman Buffalo Tiger was a proud figure of strength and self-restraint in the Miccosukee nation. He stands, wholly Miccosukee in the White Man’s world. His successful negotiations with the Federal and State governments 40 years ago enabled his people to retain possession of their south Florida swamplands. A healthy, wild, Everglades, is the basis for their freedom and their culture. His face is spiritual, rugged and dignified. The Chief is at peace with himself and his surroundings and for all that he had endured this elderly man still extended the peace pipe to all of us. His appearance seems to redefine beauty and reminds us that beautiful young people are accidents of nature, but beautiful old people are works of art. Buffalo passed away at age 94 in January 2015. Nathaniel Reed, former Assistant Secretary of the Interior, was a central figure in securing protection for the crucial Big Cypress portion of the Everglades ecosystem. In the late 1960s Reed assembled and mobilized a coalition to stop a Jetport already under construction half way between Miami and Naples. It would have destroyed most of the southern Everglades and what is now Big Cypress National Preserve. The result was that President Nixon’s administration bought the land and set it aside for multiple use. Decades later in 2000 there was another airport effort, this one to convert the old military airport at Homestead into a massive Miami airport. Again Reed led in creating a coalition against the airport which would have had low flying aircraft and their pollutants over the adjacent Everglades National Park, a UNESCO World Heritage site and a jewel of the National Park Service. Nat Reed has been a leader in setting policy and direction for Florida’s wild places for more than 50 years, contributing his time, leadership and wisdom in a tireless effort to preserve our natural wetlands. These words truly encapsulate this great man. Biologist Deborah Jansen has spent more than 30 years studying, tracking and monitoring the highly endangered Florida Panther, an "umbrella species" for the entire Everglades ecosystem. As the fate of the panther goes, so goes the Everglades. Deborah has crystal blue eyes, as direct as a panther kitten’s. However, these beautiful eyes are also part of a dedicated wildlife biologist, and a very lovely, charming and thoughtful woman. Deborah's scientific studies define panther and habitat recovery, but her dedication to educating the public on panther and habitat health distinguish her. She cares deeply about the big cats and those around her feel privileged to know her. Deborah is one of the unsung heroes for our survival. Ed Carlson, native of South Florida and now, Director Emeritus of the Audubon Society's acclaimed Corkscrew Swamp Sanctuary. Corkscrew, through Ed’s leadership, is the center of protection for crucial wetlands. Ed stands firm for the last, best wood stork nesting grounds and the watershed making human and stork existence there possible. He is a man of great stature and yet very gentle in spirit unless you show contempt for his beloved Sanctuary and its inhabitants or the broader wetlands. The Honorable Bob Graham, former Florida Senator and Governor, long known for his tireless support for protection of the Everglades, his participation in the Guardians of the Everglades® adds both statewide and national political perspective to the project. A native son, Bob Graham has dedicated his life to serving the public, and the Florida voters approved. He has never lost an election in Florida. As Senator, Bob Graham pioneered several environmental programs which have attracted national and international attention. Best known as the author and key sponsor of the "Restoring the Everglades, An American Legacy Act," which authorized the $7.8 billion Comprehensive Everglades Restoration Plan. Graham would not settle for a piecemeal approach to restoration but steered this multi-billion dollar, multi-year plan through Congress a decade ago. It is still being implemented. Rembrandt’spainting ‘Aristotle with a bust of Homer’ was the idea for Bob Graham’s portrait. Mary Barley has been involved in Everglades protection and restoration issues for many years. She and her late husband, George were both passionate about fishing. In the 1980s they were alarmed when Florida Bay turned green with algae during one of the droughts, and they were determined to work to restore the bay. They soon understood that Florida Bay, at the bottom of the flow of the “River of Grass,” could not be restored until the water flow, originating as far north as Orlando, was restored. And so a crusade was launched. In 1995 George was killed in a small plane crash as he was traveling to meet the then Corps of Engineer’s District Commander in Jacksonville. Soon after, Mary, George’s close friend Paul Tudor Jones, and their mentor and friend Guardian Nat Reed, formed the Everglades Foundation, attracted top board members and staff, spending five formative years to bring the needed funds and best science to the restoration effort. Under Mary Barley’s leadership, the Everglades Foundation built a three-pronged program for restoration: the best science available, a powerful and effective policy team, and a communication arm to bring the public a greater awareness of this precious ecosystem. Paul, his friends say, is a fisherman and hunter who also happens to be a brilliant investment manager. Paul was a fishing buddy, and close friend of George Barley. When George was killed in 1995, Paul vowed to carry on George’s relentless pursuit to restore the Everglades water flow from Orlando south to the tip of Florida Bay and into the Gulf of Mexico, preserving clean, fresh water for over 7 million Floridians and restoring healthy estuaries sheltering young fish for later commercial and recreational fishing. Now Chair of the Everglades Foundation, Paul is spearheading a drive for Federal and State governments to fund effective Everglades water use policy as well as broaden understanding of the critical importance of the Everglades to all of south Florida. As Executive Director of Archbold Biological Station since 1995 and manager of Buck Island Ranch, a 10,300-acre working cattle ranch at the headwaters of the Northern Everglades, Hilary applies scientifically supported conservation strategies to practical land management. And these ranch lands, north of Lake Okeechobee, is where much of south Florida’s drinking water originates. Hilary is highly regarded by her colleagues, many fourth or fifth generation ranchers who were initially skeptical. Hilary speaks with the knowledge of a scientist as she conveys years of research concerning Florida’s land and water agricultural uses. She has earned our respect as scientist, conservationist, and gentlewoman. Roy is the kind of man you can sense is a no-nonsense fellow. His words may be few, and like a true guardian, he watches and listens and then says exactly what he means. Chili, his sidekick hound, kept looking up at Roy awaiting his bidding and seemed quite content to be alongside his master. Working with scientists monitoring the health and movements of the endangered Florida Panther, Roy tracks big cats in Florida with his hounds and now also with a system of camera traps photographing these secretive cats. When the cats are safely treed, the dogs’ job is done and it is then up to the scientists to take data and release the cat. Roy lives and breathes the kind of existence most men can only hope to experience. Roy began tracking troublesome big cats in the west, and now, as he says, he has "a chance to give back."